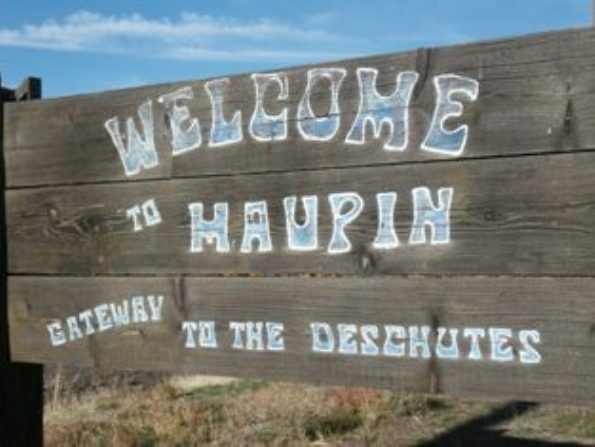 just thought i�d check in one more time before i�m off to the o. deano, fearless leader of the <?xml:namespace prefix = st1 ns = "urn:schemas-microsoft-com:office:smarttags" />hawaii spey bros, just got back from a week on the deschutes with our buddies harold and grant. despite some leaky waders and some funny cell phone and underwear mishaps, deano said the trip was awesome. 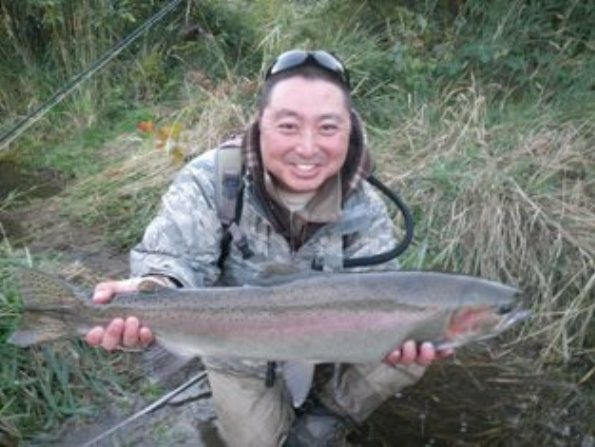 he learned a lot about spey casting and swinging flies for steelhead and even got some nice steel. 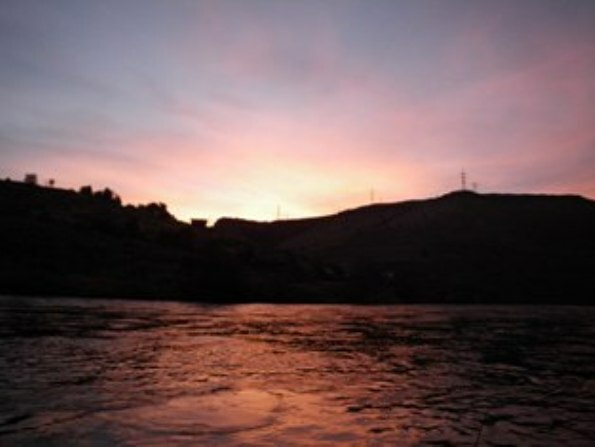 he said the big adjustment came with casting on the river in moving water. 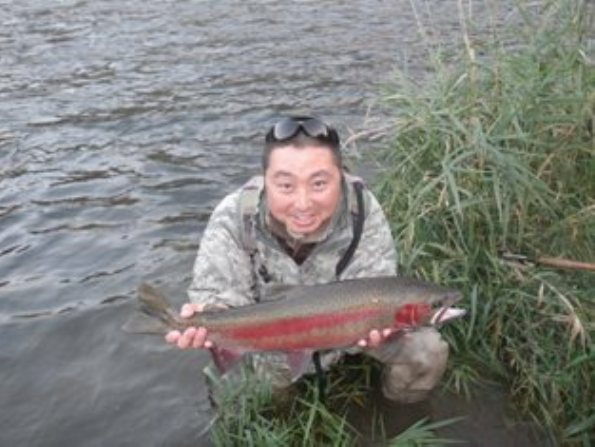 true spey casting is tough to practice here in the hi as there are absolutely no big flowing rivers except for maybe some storm ditches after heavy rains. still, those of us who do what we love, and love what we do, make the best of what we have. meanwhile, back around here, sean took his sage smallmouth rod and a crease fly out for an evening papio popping session. the sage smallmouth bass rod is probably the best rod around for chucking poppers and a steal at just under four bills including the line. 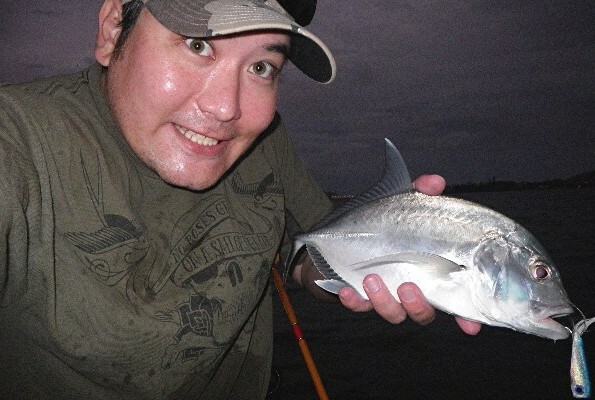 on this evening, sean got into a nice mix of little omilu (bluefin trevally) and whites (giant trevally)... wish i was there bro but i really had to go to a dinner. as for me, i actually did manage to get out one more time this week with e.t. and the boyz (and girls, sorry natalia and americana). 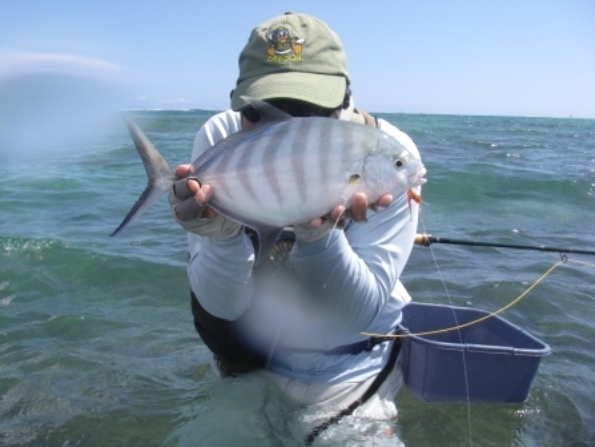 fished a day out at ke�ehi. 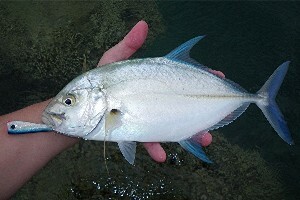 used the trusty beulah 6/7 switch rod and true to it�s name got bones sight fishing and a nice barred jack bombing. 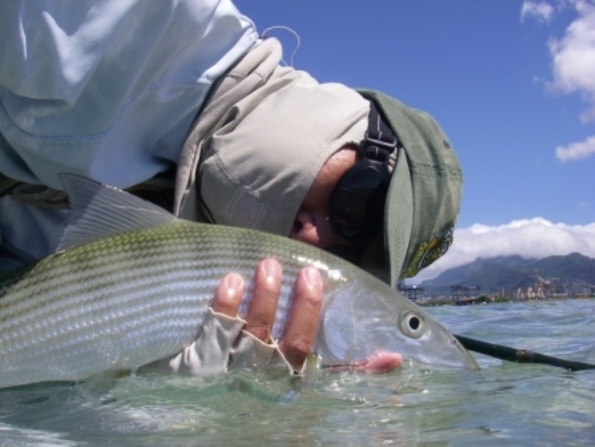 i�m starting to believe a light short switch rod is the ultimate all around bonefishing tool here in hawaii. 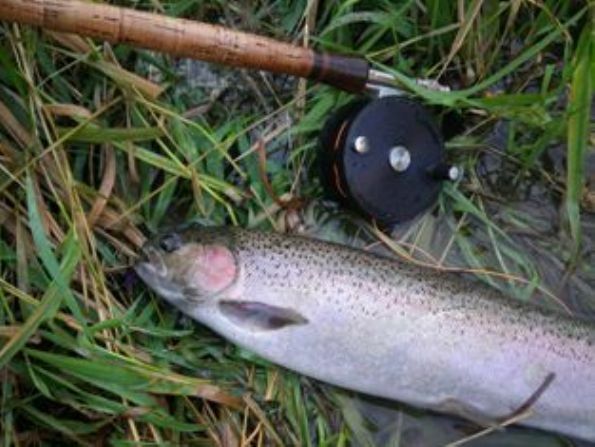 deano has been touting its effectiveness for quite a while now and hasn�t even touched his single hand rods since he picked up the two hander. i still love fishing both, but the switch rod is definitely delicate enough to sight fish all but the spookiest of shallow bones (look at how calm the water is in the pic below) yet can crack a hundred foot blind cast with little effort... but more on that later. anyway the day turned out to be fun, as usual, and not a bad way to end my fall season on the flat. deano said it's cold (for hawaii spey bros at least) but you just gotta pound... i can't wait to get the frozen pound on. the fish may not be guaranteed but the beauty of the river always is. 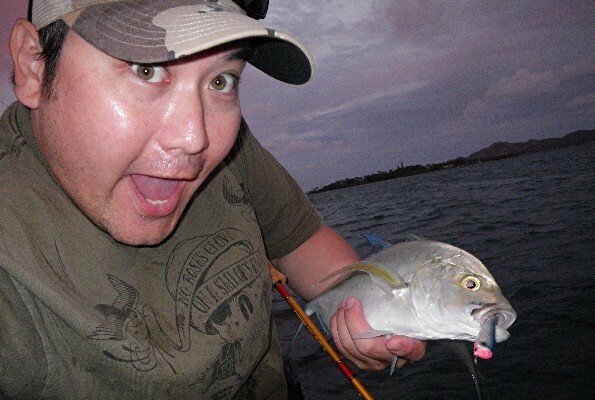 happy (and a bit warmer than deano) sean with a not so happy omilu (bluefin trevally). sage smallmouth rod, crease fly, whitey. and most of all, good times. as ducky would say, "i'm off like a dirty shirt".